Digital music and streaming apps make listening to your favorite albums convenient and accessible, but the old-school music lovers would much prefer the physical copy. Whether it's your favorite CD, an old cassette or vintage vinyl, having a piece of music to hold in your hands is special. And what better place to get your hands on those albums than by visiting one of the still-thriving record stores across the country? While they aren't as common as they once were, there are hundreds of record stores stocked full of vintage merchandise. There is something about sifting through racks of vinyl that digital music just cannot replace. So get those turntables spinning and #travelfreely for the 15 best record stores in the U.S. This shop has a huge variety of decades-old vinyl. People who truly love collecting music have to see this store whenever they visit the city. From old school hip hop to new, experimental electronic work, this store can satisfy just about anyone's taste. The store also has a full catalog of lo-fi techno released through their own store label called L.I.E.S. There is a new bunch of merchandise that comes in daily, so whenever you go into the store, expect to see something different. And it's not a large store, by any means, but the area is more accessible and less overwhelming than more spacious shops. It isn't much of a surprise that L.A. is home to a world-renowned record store. The store actually has three locations throughout California, but the shop in Los Angeles is definitely the most talked-about. You could spend hours inside of this store and discover new gem after new gem. With 24,000 square-feet of space and 50-foot walls, the volume of this store's collection is beyond impressive. There are over 100,000 CDs, vinyl, cassettes, DVDs and more. Paste Magazine actually called it the best record store in the world. On top of that, the staff is highly knowledgeable, so if you have any music-related questions they can surely help you out with it. This record store is iconic on its name alone, never mind the fact that its selection of music is unparalleled. Electric Fetus, with two more locations in Duluth and St. Cloud, has received numerous accolades from Pitchfork and Paste Magazine. Step inside, smell the incense, and absorb the astonishing collection of just about every genre of music you could possibly need. The racks are filled with rare finds and are rich in history. The shop, which has been around for 40 years, also hosts in-store performances and listening parties for music lovers to gather and celebrate what they cherish most. This place is enormous. With a selection of over 250,000 and 11,000 square-feet of space, you could quite literally get lost in this place because of its size. Either way, you'll be losing yourself in the music which features an array of historic works. This gem is hidden away among strip malls and storage lots, but walking inside is like stepping onto another planet. The front entrance is hard to miss, adorned with a giant jukebox. Reminisce on the glorious days of music's past inside this Grand Prairie treasure. The best record store in Music City is loved deeply by locals, and is recognized all over the country. The legendary spot has hosted performances from artists like the Black Keys. In 2008, Metallica recorded a live album at The Basement, a venue located right beneath the store. Stop by the store on a Monday when they offer a 10 percent discount on all preloved merchandise. Their website is also incredibly up to date with weekly new releases and vinyl, informing their customers about what will be hitting the racks soon. Being one of the coolest record stores in Portland is no easy feat, but Jackpot Records is in the running for one of the best in the country. Opened in 1997, Jackpot offers a variety of old and used vinyl, all while operating an independent record label. When a record store operates its own record label, it clearly displays a strong support for the local music scene and all of the artists involved. Jackpot also allows customers to sell the store their old records, offering assistance with the load-in if you need any help. This shop has entire rooms dedicated to genres, reasonable prices and merchandise in pristine condition. The store made Rolling Stone's list of Best Record Stores in the U.S. and its websites declares itself as having the "World's Finest Vinyl." With over 30 years of business, Jerry's is home to over one million albums in a variety of formats. Not only does the selection span musical genres like metal, R&B, and jazz but they also have an assortment of spoken word, children's music and opera. This New Orleans hot spot withstood the forces of Hurricane Katrina and was one of the first record stores to reopen in the city. The space was recently relocated to a different neighborhood but still garners the same attention. One exciting feature is in-store brass band performances, something you aren't going to see in just any record store. Louisiana Music Factory stocks strictly less-common and older collections of work. You aren't going to find radio pop albums in this place. Expect to discover blues classics, gospel, and the best soul around. Oh, and you might be greeted with free beer if you stop by on the weekend. Portland is home to the hippest of the hip. This place isn't huge but that doesn't mean it isn't any less special. The assortment of music is fascinatingly original with obscure music from all over the globe. In fact, the store started with a specialty in selling music from Thailand and West Africa but has since broadened its selection. Everything, particularly vinyl, is reasonably priced, as well. Its coziness brings a small-town feel to the atmosphere of the store. That feeling is only furthered by the opportunity given to customers to leave their mixtapes for people to listen to, which you can swap out with other people's mixtapes. This promotion of sharing local, lesser-known music is what every record store needs. Rarities galore! 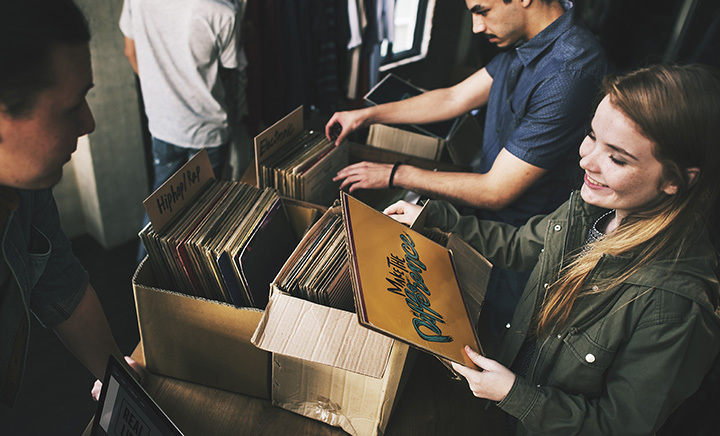 Princeton Record Exchange began in 1980, except it was actually just a man named Barry Weisfield selling used records out of his van to flea markets and on the local college campus. The store is now in a larger space and has been sine 1985, offering more than 140,000 new and used works in an over 4,000 square-foot space. The best part is that a lot of these are very reasonably priced. Due to the increasing rarity of old vinyl, reasonable prices are quite the treat. This Connecticut town seems like an unlikely place for an eclectic and rare music collection. But Redscroll provides exactly that. The store made Pitchfork's list of their favorite record stores, ranked among the hottest shops in major cities. With a musically-educated staff and an array of rare gems, it doesn't get much better than Redscroll. It's likely Connecticut won't be a vacation destination for you but if you're passing through and love discovering underground music, this is your place. There are a lot of cool record stores in New York but there is something about the experience of stepping inside The Thing in Brooklyn that separates it from all the rest. First of all, it's a thrift store, so you aren't sure exactly what you're going to discover. The aisles are stocked full of old vinyl, sort of haphazardly strewn about in some areas, but this is part of its charm. The records aren't always in the best condition but this adds to the experiences of digging through bins to find a true gem. Pitchfork named The Thing as one of their favorite record shops and described the store as "a giant black hole, sucking in excess Phil Collins records at a speed the human eye can't follow." What started as a farmer's market booth in 1979 is now one of the most legendary music spots in St. Louis. According to Thrillist, this shop's clientele consists of "fans of home-grown Americana, hard rockers and bluesmen." Fans of all musical genres will be pleased to find that the store's selection has just about everything. Peek into their bargain bin for old CDs that go for around $5. The store is also known for its deafeningly loud in-store performances where you'll be needing ear plugs and also be served free beer. Some notable performances include Marilyn Manson, Incubus, and Queens of the Stone Age. If you're a music fan and you're traveling through or to Austin, make a point of stopping into this widely-praised record store. Austin's local music scene is vibrant and Waterloo makes sure to highlight that by selling their work. The store also features in-store performances from artists like Willie Nelson. Opened in 1982, the store is surrounded by a college town vibe but remains popular among a more eccentric crowd. Paste Magazine described this one as "the best record store to grow up and grow old with." Clearly, it's a timeless classic. For nearly 40 years, Wuxtry Records has been one of the hottest spots in the U.S. to find cool, rare music. The store opened in Athens, Georgia in 1976 and two years later opened another location in Decatur. Rolling Stone named this record store as one of the top 25 in the country. One of the most notable pieces of history is Peter Buck of R.E.M. once worked at the Athens location. Wuxtry's website describes the shop as a "user-friendly retail outlet and walk-in museum of the greatest music of the last century." If that doesn't sound promising, I don't know what does.